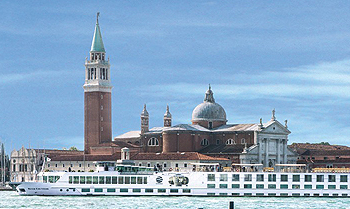 The 130-passenger River Countess is filled with light and color. Muted shades of turquoise complemented by soothing cream, taupe, and white accents create a luxurious and sophisticated environment for your up-close, unsurpassed and unforgettable Italian adventure. Ciao, bella! Lavishly appointed riverview staterooms and suites have handcrafted Savoir of England beds draped in high-thread count 100% Egyptian cotton sheets and European duvets, along with a menu of pillow options. Staterooms and suites on the Rhine Deck have French balconies. All suites are uniquely decorated and have additional amenities and services, including: daily fruit and cookie plate, and an evening amuse-bouche; slippers; private DVD; iPod docking station; Nespresso coffee machine; refrigerator; bottle of wine upon arrival; morning coffee and tea; continental breakfast; shoe shine; and free laundry service.